The western section of the Grafton Loop Trail (GLT) covers 17.1 scenic miles from the Eddy Road parking lot to the Appalachian Trail lot, both on Route 26. Combined with the 21.1 miles of the eastern section, the Grafton Loop Trail is 38.2 miles of backpacking fun that’s ideal for fall foliage adventures. In addition to being the shorter of the two halves, the western section is the easier of the two hikes. 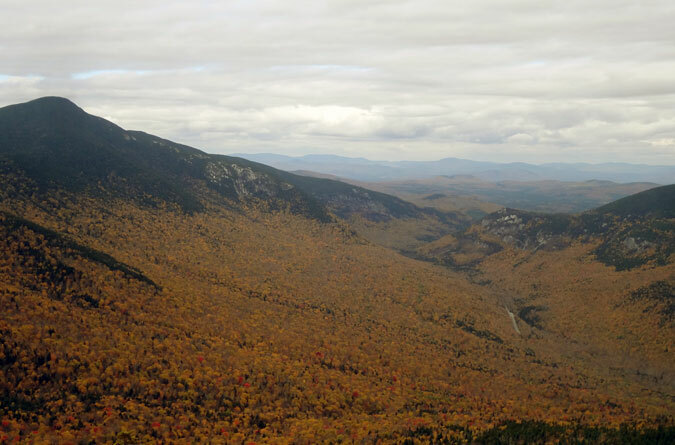 It also contains the mountain with the best views in Grafton Notch—and no, I’m not referring to Old Speck. The southern trailhead for the western section of the GLT. From the Eddy Road parking lot (no parking fee), which doubles as the Puzzle Mountain trailhead and lot, the trailhead for the western section of the Grafton Loop is 0.6 miles south (turn left coming out of the lot) on Route 26. With a pack full of overnight gear, this is the longest 0.6 miles that you can imagine. In fact, you’ll probably question whether you’ve missed the trailhead. Rest assured, you can’t miss the signage pictured above, just keep following the pavement. As with the eastern section, a lot of the western half occurs on private land, so it’s important to be respectful and only camp at designated sites. This shouldn’t be an issue, because there are four sites on this 17.1-mile stretch (not all sites are on the map). It’s also worth noting that Route 26 represents the boundary between the AMC and MATC’s territory. The western section is under the AMC’s purview and deeper pockets, which means outhouses and bear boxes at these sites! The GLT’s western section crosses the Bear River via a snowmobile bridge. The western section begins by skirting around a field and crossing the Bear River via a snowmobile bridge. The trail follows the snowmobile path for a short distance before cutting into the forest. The western section was opened in 2007, and as such it’s missing the deeply worn grooves and exposed roots and rocks that northeast hikers have come to expect from the area’s more historic trails. Once a fresh layer of leaves have begun to fall, it can be down-right tricky to follow the path. Just keep an eye open for the blue blazes. Which way does the GLT go? The Bald Mountain Campsite doesn’t appear on either GLT map, but it’s located just two miles from the southern trailhead for the western section. The site includes a brook, two wooden tent platforms, an outhouse, a designated cooking spot, and a bear box. The early going of the Grafton Loop Trail’s western section includes two short climbs up Bald Mountain and Stowe Mountain (elevation 2,730 feet), neither of which offer much for views. A good portion of this hike occurs at lower elevations within hardwood stands, which is what makes it such an outstanding option for fall backpacking. In between Stowe Mountain and Sunday River Whitecap is the Sargent Brook Campsite. In addition to the brook, there’s three ground tent spots, an outhouse, a designated cooking spot, and a bear box. This hike is worth it for Sunday River Whitecap alone. At only 3,335 feet in elevation, Sunday River Whitecap can fly under the radar of peak baggers, but its open summit offers the best vistas in Grafton Notch with scenery that includes a side profile of the Mahoosuc Range, Old Speck, Baldpate, and a dead-center view of Grafton Notch. This view of Grafton Notch from Sunday River Whitecap is far better than what you’ll get on Old Speck or Baldpate. Considering the high volume of tourist traffic in Grafton Notch, especially in leaf-peeping season, outstanding 360 degree views, and relatively low elevation, one would expect Sunday River Whitecap to be overrun with hordes of visitors. In fact, the opposite is true! At seven miles, the Grafton Loop Trail from the Fort Eddy lot is the shortest path to the summit, which eliminates spur-of-the-moment day hikers. Aside from a few hearty locals who know how to bushwhack to the summit, it’s typically only visited by those doing the western section of the Grafton Loop. Consider yourself unlucky if you see anyone else on top! The Mahoosucs in October as seen from Sunday River Whitecap. Sunday River Whitecap offers a unique view of Goose Eye Mountain that you can’t get from the Appalachian Trail’s crossing of the Mahoosuc Range. Old Speck as seen from Sunday River Whitecap. The takeaway from this image is that the GLT’s western assent of Old Speck, from a clockwise hike, is by far the most gradual and easiest way up. Last but not least, the view of Baldpate Mountain from Sunday River Whitecap. From Sunday River Whitecap, the Grafton Loop Trail descends into Miles Notch, elevation 2,350 feet, and after cutting through the notch, begins a long and gradual climb up an arm of Old Speck Mountain. Only 3.3 miles from Whitecap is the Slide Mountain Campsite, which is where my brother Brad and I called it a night. It’s a nice little site with a small brook, an outhouse, three ground tent spots, a designated cooking area, and a bear box. The bear box at the Slide Mountain Campsite. I can do without an outhouse, and as a hanger, the tent spots don’t matter very much to me, but the bear box…easily my favorite backpacking campsite amenity. Thank you AMC! After the Slide Mountain Campsite, the Grafton Loop Trail begins climbing out of the hardwoods and along a ridge. The Bull Run Campsite, only 0.9 miles from Slide Mountain, and two miles from the summit of Old Speck, was another surprise for us because it doesn’t appear on the MATC’s map. It includes the same amenities as Slide Mountain with the added benefit of two wooden tent platforms. The ascent of Old Speck doesn’t get steep until the final mile. If you’re accustomed to hiking Old Speck via the Appalachian Trail’s rugged southbound hike from the Route 26 lot, or the brutal northbound AT ascent of the Mahoosuc Arm, then it’s hard to believe that the Grafton Loop Trail is in fact climbing Old Speck from this direction. My brother Brad on the GLT’s Old Speck climb. Note the lack of wear and tear on the trail compared to the two Appalachian Trail routes to the top. A frosty fall morning atop Old Speck Mountain. The Old Speck Fire Tower. We watched a couple hikers brave the frozen rungs to get up there…and stare into the clouds. The Grafton Loop Trail between the summit of Old Speck and the northern Route 26 parking lot coincides with the Appalachian Trail. I’ve often thought of this section as the perfect day hike because it balances 3.8 miles of steep terrain with a few flat reprieves. The upper third is especially steep and rocky, and on chilly fall mornings before the snow comes it can get icy, so it’s not a bad idea to pack traction if the mountain forecast is calling for freezing temps. A steep and rocky section on the Appalachian Trail’s climb of Old Speck. This was taken on the upper third. Nearing the bottom of Old Speck, the Grafton Loop Trail follows a brook for a short distance. The bottom third of Old Speck from the Grafton Notch Route 26 parking lot offers the Eyebrow Trail as an alternative route. We chose not to take this adventure, but here’s the Eyebrow view from the parking lot.